Are you ready to be the king of the deck? Sure, in a standard deck of playing cards there are four kings but everyone knows who the true ruler of the deck is. It’s the king of hearts! Diamonds are nice, clubs are powerful, and spades are pretty wild, but it’s all about the hearts. Any serious card player can tell you that. This easy to toss-on costume will instantly transform you into the most valued card in any deck. What really makes the king of hearts stand out from the rest of the face cards is a unique feature. He is the only king without a mustache! The other three kings feel as if they need to compensate for something and prove their manliness with facial hair. You, however, have nothing to hide, hence your hairless upper lip! This costume comes with the card tunic and a golden crown; just about everything you need for a costume party. You can also take a look through our bodysuits to find one to throw on under the tunic. We would suggest a flesh colored one or a simple black one. Then a pair of white gloves along with some white sneakers and you’ll be ready to hit the party scene! 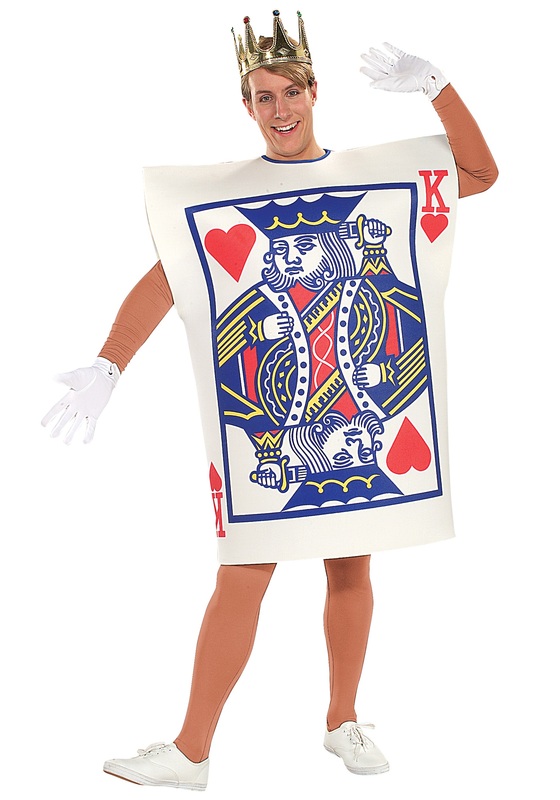 Be the ultimate trump card this Halloween with this King of Hearts Card Costume. Everyone will be willing to place their bets on you! Just watch out for any magicians that try to make you a part of their card tricks.